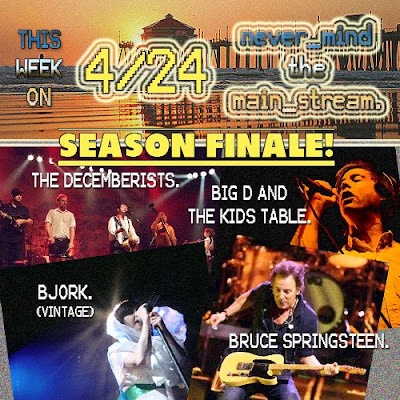 Never Mind The Mainstream on KUR (College Rock Radio): THE FINAL SHOW OF THE SEMESTER! THE FINAL SHOW OF THE SEMESTER! Ladies and gentlemen and boys and girls: our awesome, little radio show has reached it's pinnacle and now it is time for the final show. Though we'll be back in late September to rock the airwaves with the best alternative and indie rock from yesterday, today, and tomorrow once more, you will sadly be without our voices and words of wisdom for a lengthy four months, otherwise known as summer break. It is truly a bummer, but never mind that - we're going out in style! We're using this show to play most of the tunes we always wanted to play on the air, but never got around to spinning. So we're excited about this one; I guess you can say it's our gift to ourselves for a job well done. A lot of music will have to do with the summer, which we are patiently waiting for. We'll talk about our plans, give you some summer fun tips, and of course, crank out the greatest underground music the only way Never Mind the Mainstream can! On the line-up, we got mostly classic and themed sets (Big D & The Kids Table, Bruce Springsteen, The Hold Steady, and Neutral Milk Hotel), but we'll offer the audience some newbies, just for fun. Like I said, this show is our finale and we're going out strong with one of best shows yet! So tune in Friday, 6-8 PM, @ kur.kutztown.edu, and call in to (610)-683-4058 or IM us on our AOL Instant Messenger, KURRequest. See you then! Have a great summer! The Boss. The Jersey. The Beach. The Girls in their Summer Clothes.